Breitbach's Country Dining in Balltown, Iowa, bigger and better than ever. All photos by Phil Roberts. One of the beautiful dining rooms. 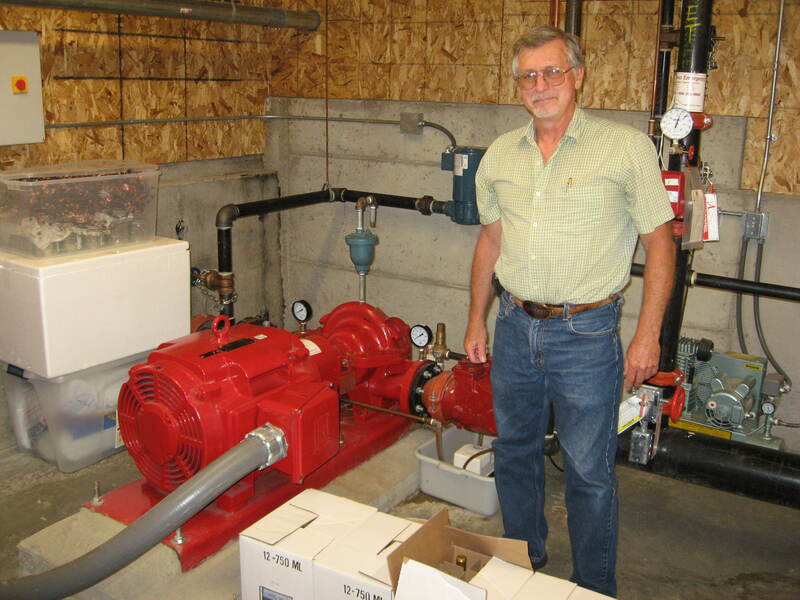 Dennis Hoppenworth shows off the pump for the sprinkler system. Cooks are at work in the modern kitchen. 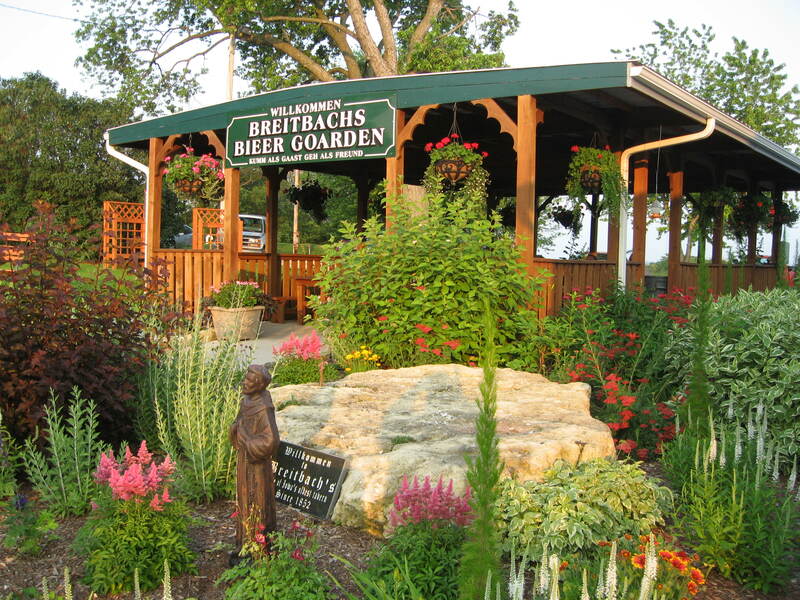 A beautiful beer garden sits behind Breitbach's. 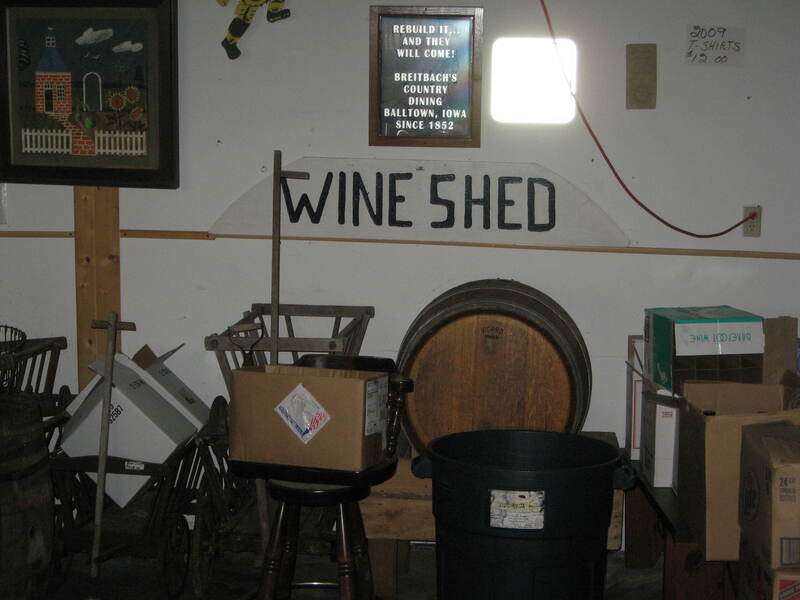 An interior shot of the Wine Shed. A prophetic sign says "rebuild it, and they will come." You can't help but feel relaxed at this place. 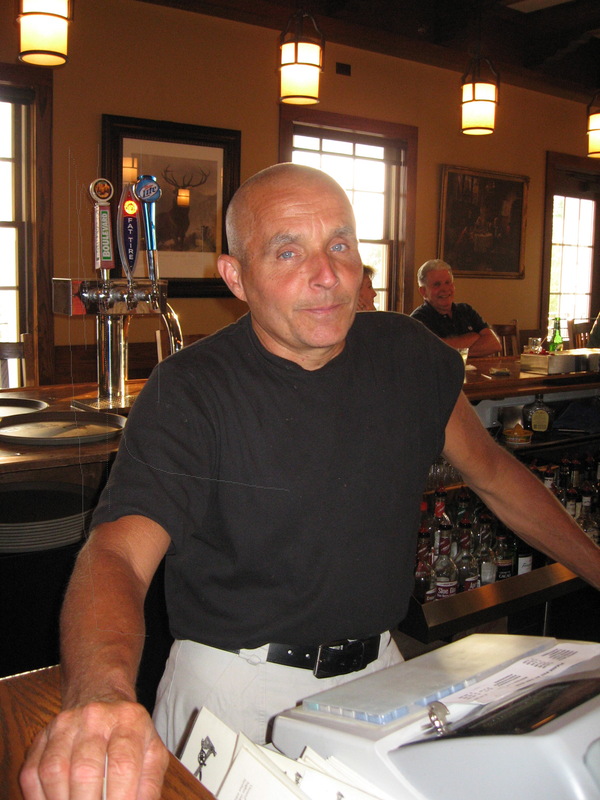 Mike Breitbach, a short, thin guy in his early 60s with a shaved head, flits around the restaurant, doing whatever needs to be done. He’s a bundle of energy. Replenishing food items on the buffet. Seating people who just walked in. Taking money at the register. It’s 6:30 on a Thursday night and Breitbach’s Country Dining, the restaurant that put tiny Balltown (population about 60) in northeast Iowa on the map, is hopping. Two of its three dining rooms are busy. So is the bar room. But we’re certainly not newcomers. My wife and I have dined here many times, and we’ve taken a detour home from a trip to Minnesota just to drive the Great River Road and eat at Breitbach’s once again. Some diners on this night are enjoying the buffet. Other folks have ordered off the menu. But everyone who has ever eaten at this place in the past knows to save room for a piece of delicious homemade pie — I vote for coconut cream as the best — crafted by Cindy. An elderly couple is headed to the door. Breitbach gives the wife his trademark bear hug and shakes her husband’s hand. “Come back again,” he says. You know they will. 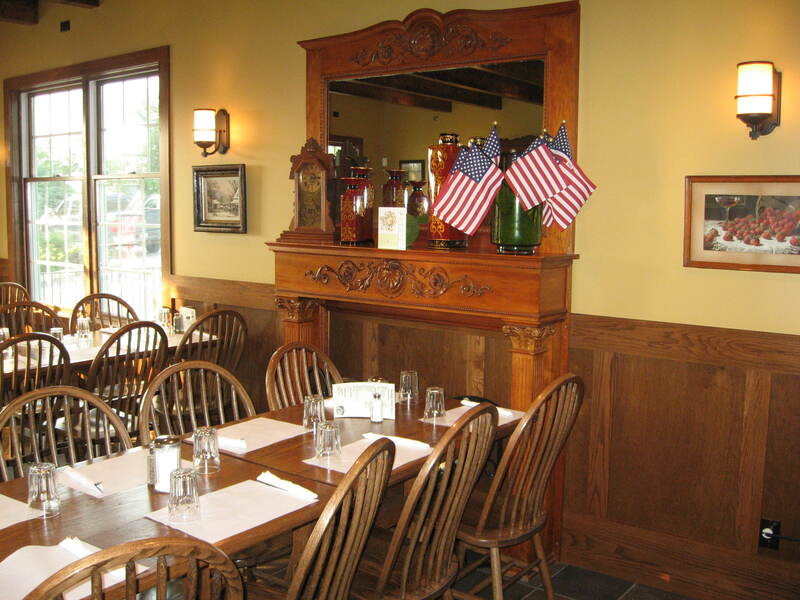 Breitbach’s is a popular restaurant and bar. But it’s more than that. Breitbach tells us about the visit of a seasoned West Virginia newspaper reporter who made an observation. It’s evident on this night that the community is glad Breitbach’s Country Dining is still around after not one, but two devastating fires threatened its long life. 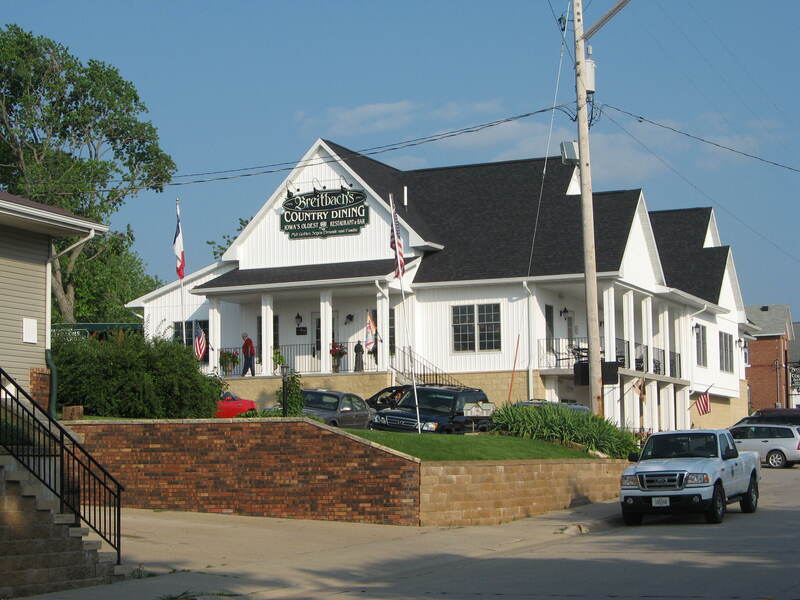 Iowa’s oldest bar and restaurant opened in 1852. Jacob Breitbach, Mike’s great-great grandfather, worked for the original owner and purchased the stagecoach stop in 1862. Since that time, the Breitbach family has been in continuous ownership of the place. But it all nearly came to an end when a fire destroyed the family business on Christmas Eve morning in 2007. The place was closed at the time, but Mike and some relatives were eating breakfast there in preparation for a funeral dinner later in the day. Mike smelled gas, and minutes later an explosion in the basement blew him through a kitchen door. The place burned to the ground. The community and people from all over the country soon rallied around the Breitbach family with words of encouragement and donations of food, money, labor and materials, and rebuilding of the restaurant began. The new facility opened Father’s Day weekend of 2008. 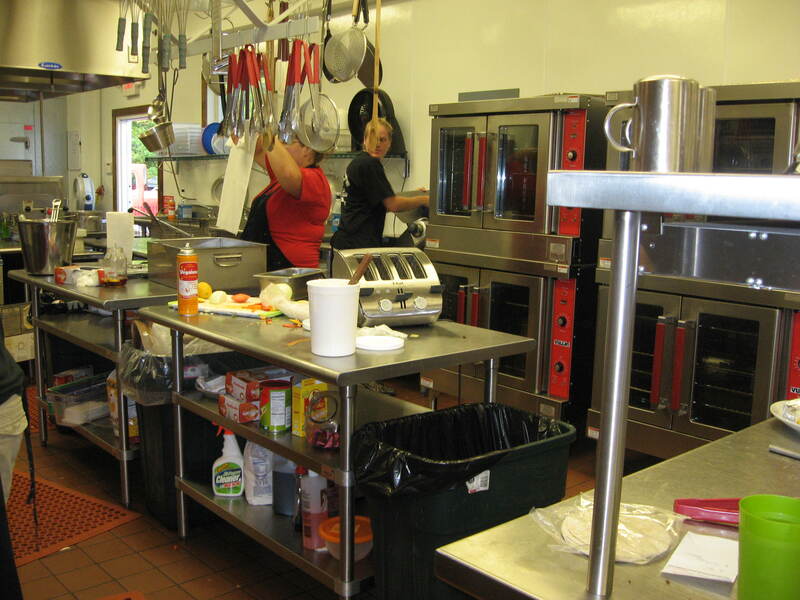 “Busloads of people came from all over Iowa, Wisconsin, Minnesota, Illinois and other parts of the country to see the work and enjoy the same home-style cooking they had previously enjoyed,” says Breitbach’s website, breitbachscountrydining.com. But tragedy struck a second time. On Oct. 24, 2008, 10 months to the day after the first fire, the Breitbachs, who live in a farmhouse a couple of miles from town, received a 3:30 a.m. phone call that their new building was burning. It was destroyed by a fire of undetermined origin. After the shock subsided, people wondered if the Breitbach family would rebuild a second time. The answer – yes! — came just before Christmas of 2008 following a meeting of Mike and Cindy Breitbach and their five sons and two daughters, all now grown and all of whom grew up working at the family business. The community soon rallied around the family once again, and the rebuilding started. The second new facility — bigger and better than the first new building, five times larger than the original building and protected this time by a sprinkler system — opened Aug. 1, 2009. Customers longing for the Breitbach experience have returned. “Business is just crazy,” Breitbach says. The place served 1,800 people on Father’s Day. After our meal, Breitbach, still busy with customers, tosses his keys to his friend, Dennis Hoppenworth, and asks him to take us on a tour. Hoppenworth, a Balltown councilman, is one of the locals who gather daily at Breitbach’s for breakfast and Thursday evenings for dinner. He and his wife are Waterloo transplants who have lived in Balltown since 2002, he tells us. They were looking for a place along the Mississippi for retirement, he says, when they discovered Balltown and its beautiful panoramic view of the countryside. As luck would have it, a house down the street from Breitbach’s was for sale, and they bought it. Hoppenworth shows us through the dining rooms, with their dark tile floors; gold-painted, wainscoated walls; white ceilings with stained wooden beams. They’re all decorated with antiques and country crafts. A central hallway where hungry customers wait for a table is lined with framed newspaper and magazine articles about Breitbach’s. A brightly lit modern kitchen with stainless steel food preparation tables is home to two full-time cooks and some parttimers. Down the basement there’s a fourth dining room for meetings and private parties. There’s also a $50,000 pump for the sprinkler system’s water, which is in an exterior storage tank. “It’s tested weekly,” says Hoppenworth says of the pump. 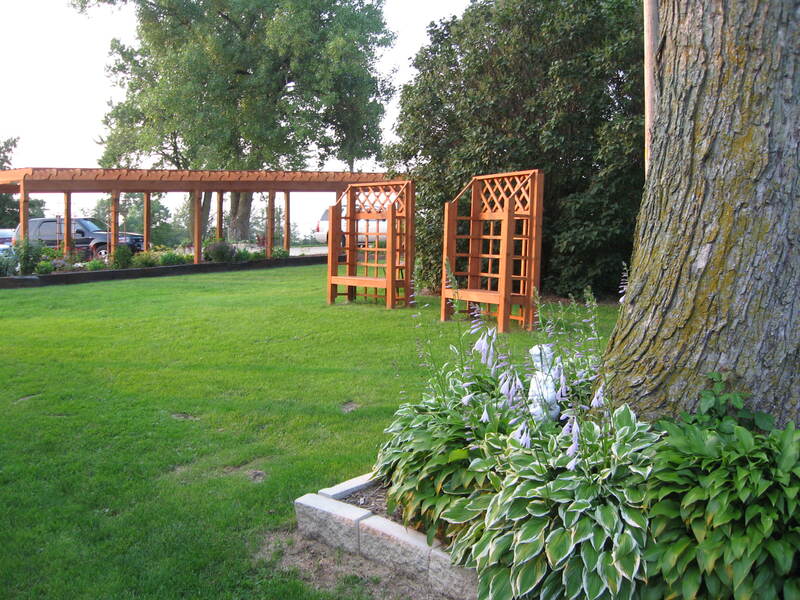 Out back, in the middle of a horseshoe-shaped, gravel parking lot that wraps around the building, is a beautifully landscaped, shaded beer garden. Gardener Russ Pfeler, who lives down the road in Sherrill, Iowa, is on hand, watering his plants. Nearby, Hoppenworth points out, is the wine shed. That’s where locals commisserated after the fires and where volunteers brought in food to feed the workers who twice rebuilt the restaurant. Just outside the curved portion of the horseshoe parking lot is Breitbach’s ballpark. “It’s been in the family since 1915,” says Hoppenworth. One wonders how this hard-working family ever finds time to use it. Copyright 2010 by Phil Roberts, Creative Enterprises. This article has been submitted for publication to The North Scott Press, Eldridge, Iowa.